The most important thing to do if you come across a snake is to ensure the safety of your family, co-workers or pets. If the snake is indoors, make sure everyone moves out of the room, close the door if possible and place something like a towel along the bottom of the door to prevent the snake escaping the room. Next step is to call a snake catcher. If the snake is outside, observing the snake from a distance while calling a snake catcher is a great idea. Often a snake seen in the back yard has moved on to be several houses away by the time the snake catcher arrives. But always keep the safety of yourself and those around you in mind. Many Australian snakes are of a very similar colouring and patterning making positive identification a difficult task. 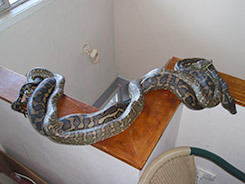 While identifying a large carpet python is usually not too difficult a task, some of the smaller snakes can require a count of the scales across their back or close examination of the scales on their head to be correctly identified and this can be the difference between a harmless or lethal bite! It’s for the above mentioned reasons that it’s not wise to try and catch or trap a snake. Also we may have some highly toxic snakes in Brisbane, Loganand Ipswich, but those snakes are also quite fragile and attempts to catch a snake can cause injury to the animal, which is something we want to avoid as much as we do a person being injured. We hold permits issued by the Department of Environment and Resource Management that allows me to relocate the common snakes of south east Queensland if they are a threat to human health and wellbeing. All snakes that are caught are released on the same day as capture, in a more suitable area, where they will be free to go about their business without crossing paths with humans. Including The Gap, Bardon, Ashgrove, Rocklea, Oxley, Chapel Hill, Toowong, Algester, Forestdale, Pullenvale and surrounding suburbs. Albany Creek, Carseldine, Strathpine, Everton Park, Ferny Hills, Samford, Pinkenba and surrounding suburbs. Including all Moreton Bay and Caboolture shire suburbs.